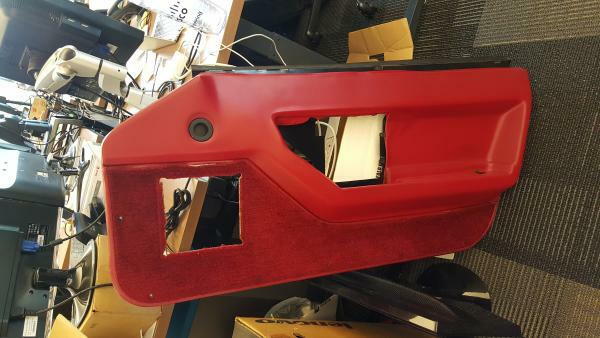 I have a 1986 (should fit 84-89, same as my 88s) interior passenger panel. The carpet is coming up a little on the edges, but carpet is in great shape, nice and clean. Vinyl is in great shape too. The interior window seal is also in excellent condition. I am relocating and this is from my old corvette that got whacked and totaled. Insurance company would only give me 150 for my entire interior (had it all out) so i said screw it and kept it all. Im relocating now so I need to sell this fairly quick. So taking offers, I dont know how much it weighs, I wish I had a scale. But the shipping state and zip would be CA and 94063. And yes it is in my office. someone has to want this.